Neck stretches can be an important addition to a health maintenance routine. However, stretches are extremely unlikely to provide a cure from virtually any type of neck pain, nor even facilitate any degree of symptomatic reduction for most patients. Stretching the neck can act upon various types of tissues in the cervical anatomy. As long as care is exercised, stretches can be done for life, helping to maintain and protect physical functionality into very old age. This guide details the usefulness of stretching the neck, as well as provides examples of some of the most common types of cervical stretches. Additionally, we will explore the effects of stretching the neck and provide guidelines for achieving safe and satisfying results. Before beginning, it is crucial to consider the goal of the stretches. Basic stretching should be performed prior to beginning any type of vigorous exercise, in order to warm-up the soft tissues and facilitate a full range of motion. Meanwhile, longer periods of static stretching should be performed after the body is already warm, at the very end of any exercise that is being utilized. In essence, the first type of stretching constitutes a warm-up prior to activity, while the second variety describes an opportunity to truly elongate the soft tissues to enact specific results over time, such as increasing flexibility. Warm-up stretches prepare the body for physical exertion and therefore should be done cautiously and without placing too much stress on the neck. The neck should not be forced to hold any stationary position for too long, but instead should be worked through the full range of movement fluidly. The stretches chosen should not attempt to max-out the range of motion, but instead should just allow the soft tissues of the neck to acclimate to continuous movement and multiple positioning. Meanwhile, static stretches are used during the cool-down segment of a work out. These stretches are intended to increase effective range of motion and eliminate certain types of soft tissue conditions, such as muscle imbalances. Static stretches involve holding a particular position for a longer length of time, in order to really act on the soft tissues being stretched. Regardless of the type of stretching being attempted, the person should not use their hands to force the neck into any position. Instead, allow the muscles to do the work by simply moving the neck to its desired place without any other manual assistance. The first stretch is a simple linear motion that entails moving the head up and down, as if motioning an exaggerated “yes”. 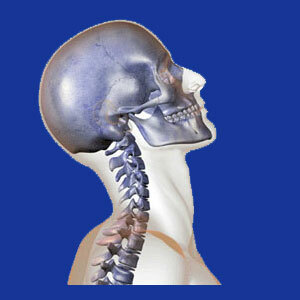 Move the chin to the chest, then move the occipital to the upper thoracic region in a repetitive pattern. This motion should be performed slowly during warm-up and cool-down. The end position at either side of the motion can be held for a longer time during cool-down stretching, if desired. The next stretch involves making an exaggerated “no” motion with the head, turning the neck from side to side while keeping the chin at an even level. Once again, this motion should be slow and deliberate and can be held in the ending position during cool-down stretching, if desired. The third stretch involves performing small circles with the head, both clockwise and counterclockwise. To do so, rotate the chin to the chest, then around in a circular pattern until the chin returns to the chest. Then, repeat in the opposite direction. The full motion of this stretch will have the participant looking down, then left, then up, then right, then ending in a downwards position. Circles should be slow and deliberate, with fluidity in every direction. No static positioning is needed during cool-down phase stretching. Finally, the neck can be stretched downwards and upwards. To perform the downwards motion, first raise the shoulders and try to retract the neck straight down towards the upper back, keeping the chin level. While the neck will not actually refract at all, the shoulders will rise above the chin-line. Next, stretch upwards by lowering the shoulders as far as they will go and straightening the middle back and neck, as if some force were pushing the head directly towards the sky. Once again, the chin should be level and not move during this stretch. Both of these motions are very subtle, but will be felt, more than seen. Many people like to manually crack their necks or stretch them using their hands. While there remains some controversy about possible dangers of doing this, most doctors agree that using the hands to forcibly crack the neck is simply unnecessary. Stretching should never be painful, as long as the tissues are healthy. If you do experience any pain while stretching the neck, be sure to discuss this occurrence with your physician or physical therapist. In any case, no patient should begin any program of exercise or stretching without consulting their doctor, therapist or certified fitness trainer. Certain conditions and diagnoses may contraindicate some types of stretches for some patients. Be sure to fully understand if any of these cautions or prohibitions apply to you before undertaking any neck stretching. In summary, stretching the body is a great warm-up activity that can prevent injury during physical exertion. Stretching is also a great cool-down activity that can slowly increase effective range of motion in the spinal joints, as well as in the soft tissues, such as the muscles, ligaments and tendons in the neck anatomy.